Forty-seven Years Of Horse Experience – At Your Service! Can You Find The Seven Horses? Perhaps we have all seen the amazing art of Jim Warren, even though we haven’t paid enough attention to the artist himself. Warren has painted many of the stunning pictures that circulate the internet and this is but one of them. He has created a series of ‘find the hidden objects’ paintings with animal and marine life. The inspiration for me to place this painting here, at this time, came from TrotonTV’s blog at blogspot, where he had placed an image of another seven horses. He had created quite a stir. Because of Jim Warren’s amazing abilities, I will be looking further into his work to see what other goodies he has painted. There are Seven Horses in this picture. Not all of them are easy to see. Can you find them? I found six and but the seventh eluded me for the longest time. They are all pretty clear but it is necessary to focus your eyes from a distance to see the one that is outlined by the vegetation. My eyes focused on the sea and I couldn’t see the horse, lol. Thanks for the visit, Hop On a Horse. after a long search working with my friend we have found the ten horses hidden in this amazing and wonderful picture but we can say that jim warren is a great artist and einstein is back. Wow Rita! You certainly have exceptional perception. I know I can’t see them all, but then I don’t have a very artistic mind. Maths and sciences were always my deal. The Giddy Up Pony Camp Website is now up with a whole new look at http://www. giddyupponycamp.com. Contact Amanda At : trouby@hotmail.com for more information. 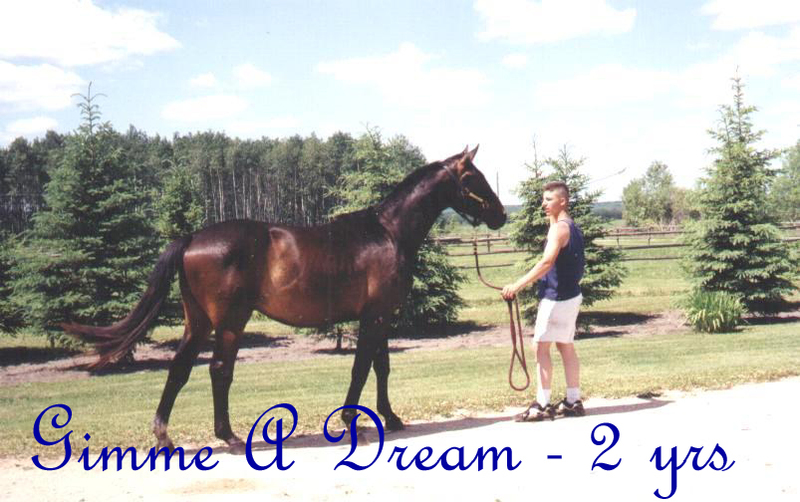 Gimme A Dream is a Horse, an Hanoverian gelding to be exact. He is not the most perfect horse in the world. In fact, Gimme is far from perfect, but he is mine (or I’m his). He stands almost 17hh and weighs almost 1400 lbs. He is a big boy and when he wants something, not much stands in his way. But I do…, and that leads to conflict! I’m Wynn Currie and I’ve lived with both saddle and harness race horses since I was 8 years old. My sister and I started re-training our Standardbred mare, Mighty Anna, to become a good saddle horse. We taught her to canter and jump four foot, six inch 45 gallon oil barrels with us on her back, without a saddle or any means of holding on other then with our legs. We raised Anna’s new born colt, Dancing Moonbeam and we did this without interference from any adults. I was only 9-years-old, at the time and my sister was twelve. Horses have been in our lives ever since. We live on the Magdalen Islands or Iles-de-la-Madeleine, Quebec, Canada. The Magdalen Islands are in the center of the Gulf of Saint Lawrence and happen to be surrounded with more than 300 km of sandy beaches, perfect for horseback riding. Nine-year-old Dream has two mares to his herd – Willow Breeze (Minority) is a nine year old Canadian and stands almost 15hh and Woodmere Frilifili (Frilly), a Standardbred filly, standing almost 16 hh. Occasionally there are other horses in the area. So come along for the ride, the view or just a plain good time. We don’t have much, but we don’t need much either.